Providing you the best range of carton sealing machine with effective & timely delivery. This system combines auto carton sealing machine with fully-auto strapping machine to meet the customer’s needs and reduce labor costs. Design of combining these two machines together makes the job done in one process. Providing continues sealing and strapping offers cost effective and reliable quality, is easy to operate and maintain. 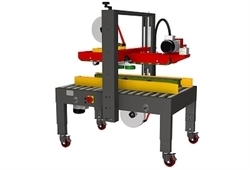 Carton sealing machine and strapping machine can be used separately. All-in-One design for the main head is solid and durable. The Aluminum Arch is specified for small cartons. The strapper can precise the strapping at the requested position. The brush guiding mechanism ensures the strapping at the proper position and not to slant. Brilliant performance. Patent tapping head prevent the OPP being folding and make the carton sealing more smoothly. Furthermore, the machine also installs two or more sets of sensors to meet the strapping needs. Its cushiony construction will reduce fraction while sealing cartons. 60 seconds auto-stop device will reduce unnecessary consumption and costs.